Before he organized the recent white supremacist rally in Charlottesville, VA, Jason Kessler wrote for The Daily Caller and the white nationalist site VDare and appeared as a purported expert on Alex Jones’ Infowars network. Kessler was the organizer for the “Unite the Right” rally in Charlottesville that featured white supremacists and neo-Nazis. President Donald Trump responded to the violence by issuing a generic condemnation of problems “on many sides” and declining to specifically call out white supremacists — behavior that fits his history of emboldening the white nationalist movement. 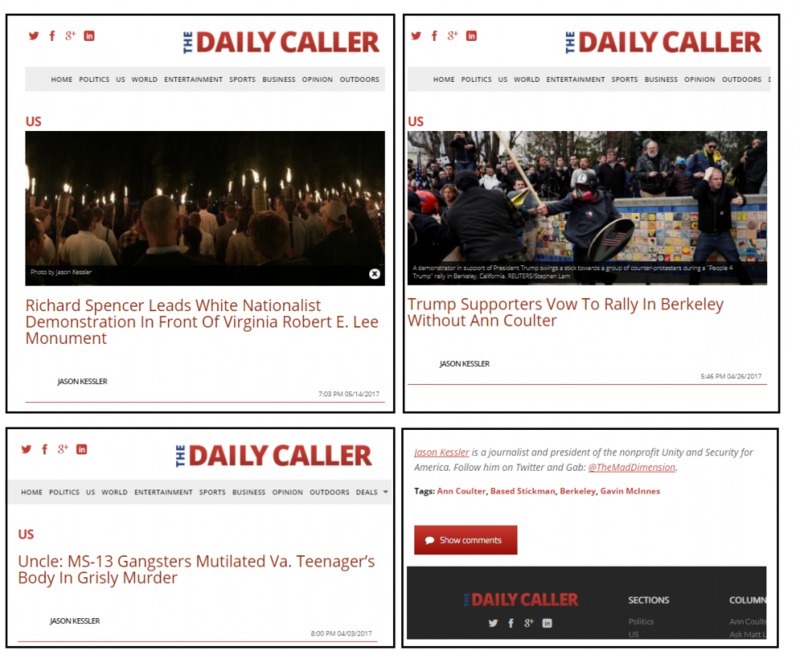 Right-wing media outlets like The Daily Caller have also played a role in cultivating white supremacist organizers like Kessler. The Daily Caller contracted with Kessler “to contribute reportage to” the right-wing site this spring. He wrote two pieces in April with the headlines “Trump Supporters Vow To Rally In Berkeley Without Ann Coulter” and “Uncle: MS-13 Gangsters Mutilated Va. Teenager’s Body In Grisly Murder.” Both pieces promoted Kessler’s organization Unity and Security for America and his Twitter account. Media Matters contacted Daily Caller editors this morning about the outlet’s relationship with Kessler, whether the editors regretted publishing him, and if they would consider publishing him in the future. Shortly afterward, the publication removed Kessler’s author page and all his pieces on the site. Media Matters followed up by asking for a clarification about why the site deleted those pieces. The Caller did not respond to a request for comment by publication time. Infowars has also had a role in promoting Kessler and his racist work. Editor Paul Joseph Watson, who himself has a history of racism, aired a roughly 30-minute interview with Kessler in January to “discuss the insanity of the left and how they have lost all grip on reality.” The interview is featured on Alex Jones’ Youtube channel with the headline “Jason Kessler: Anti-White Racism Must End.” Infowars also posted a roughly 20-minute April interview with Kessler during which he warned Infowars viewers that there’s a “very pressing danger with these people” who are trying to take down Confederate statues. Both interviews promoted Kessler’s nonprofit and Twitter account. Alex Jones aired a roughly 15-minute interview with Kessler on August 13, the day after the Saturday rally. During the segment, Jones complained that the media is “penalizing this guy because he’s saying one-third of the racist stuff that I disagree with against the [George] Soros group that’s a total cutout, just make us fight with each other. So how does media say he caused all the violence when clearly antifa was the ones attacking?” (Infowars has been claiming that philanthropist and one-time Media Matters donor George Soros has been purposely funding the Charlottesville violence.) Jones later said during the interview that Kessler walked into a “trap” set by Kessler’s enemies by being at the Charlottesville rally this past weekend. Kessler wrote three pieces for the “alt-right” affiliated outlet GotNews from January through March. Trump has reportedly received news from that outlet, which is headed by racist troll Charles C. Johnson. The thing that is truly scary about the Neo-Nazis (sorry, but I refuse to call them the “alt-right” anymore) is how well organized they have become across their different organizations to the point where one group will advertise the activities of another. If you follow “who” they seek as “recruits,” you see their true agenda. The same as Hitler’s …go after the young and impressionable to create a powerful, but quite suicidal army of young high school and college age kids. It’s no surpirse why these Neo Nazis chose Berkeley in 2016 to preach their hate. Which is also the reason they decided the college in VA, Texas A&M and a revisit to Berkeley is on their hit list. The reality is that now that one of them committed murder using an ISIS tactic of plowing a car into a crowd of counter protestors, they are no longer going to be able to use their 1st Amendment Rights as the excuse to go around like the KKK with lighted torches and rampaging freely through American streets. Americans know better than to allow thugs to take over. So these haters will be forced back into the Idaho and Montana woods where they can practice their Hitleristic militia games and hide. Two interesting things you mentioned . . . First, ISIS recruits young, impressionable people who tend to have little knowledge of Islam by filling their heads with ideas that purport to be consistent with Islam but are really the twisted ideas of murderous thugs. Simikatly, the neo-fascists in the US recruit young, impressionable people with ideas that are decidedly un-American but are purported to be patriotic but violate the principles upon which America was founded. Second, where did the tiki torches come from. They appear to be all the same. Protesters didn’t all buy the same torch. These were supplied by someone or some organization. Who funded this? Was there a conspiracy to foment a violent insurrection? If so, should not someone be charged? Some years back, I had to ghost write an article for a blog client about the “mechanics of power.” In doing the research on the world’s most powerful men and women, their power must always have a base that is founded upon personal insecurities. Even Genghis Khan recruited virile, young males for his rampaging, marauding hordes. It’s a bit vague to me now but in that research I recall something about “dynastic order” that requires an older, wiser leader who elicits obedience from younger followers. However, Trump’s behavioral patterns lean far closer to the early beginnings of Hitler’s power. Here’s why. Hitler knew he needed one party rule. Trump already had that because that is precisely what Newt Gingrich stated as Speaker of the House, “We will have one party rule only…the Republican Party.” So, part of the foundation for Trump’s power comes from the idea of the Republicans that their majority was one party rule. Unfortunately, the worst element in US society today, Trump, figured out pretty quickly how to make use of that one party foundation. So, his turning Neo Nazis into “innocent victims” is this world class snake oil salesman’s first step to solidifying his “base” of supporters, nearly all of whom hate blacks, immigrants, Jews, Catholics and use women like birthing machines. Trump knows exactly what he was doing when he defended the Neo Nazis. He created the third rail of the government. His government. His party and HIS rule. When you watch that video, watch the Neo Nazi with the assault rifle. A tall, husky counter protestor took his life in his hands to grab it away from that Nazi. Now, for all time, David Duke, Richard Spencer and the rest of the low life bums of the anarchist, anti government haters of Nazism are once again out of the closet emboldened by Trump. The last KKK Grand Wizard. D.C. Stephenson, of the Indiana KKK, kidnapped Madge Oberholtzer, raped her and had cannabalized her by biting her over more than 80% of her body. She ended up dead because Stephenson refused to get medical treatment for her. The doctor who testified she had also been poisoned with mercury. This is who Trump supports? If there’s one thing that should be painfully obvious to those who were unsure of whether the GOP has provided a haven for hate in America, then Jason Kessler and the recent events in Charlottesville should clear the fog. What we have at last openly displaying its amoral and satanic demeanor is an abnormality and open display of the depths of depravity, to which a huge segment of America was already possessed with, and potentially on the verge of laying bare the bleak soulless facade of humanness which lay hidden for decades now. And with Trump walking back earlier today what was already a failed 2nd attempt to clean up his act, we have a pathetic excuse of a human masquerading as a President with no sense of proportion or remorse for his despicable behavior and degenerate personality. And now, back to Jason Kessler. Here we have a middle-class preppy type male who already was granted by default of his parents’ physical appearance, and therefore “qualified” to be handed all the privileges America has deceived itself into granting, based on a transitory quality of coloration of skin cells. This superficial aspect of all humans has an unusually strange effect on those “Africans” who made a trek into Europe, many of whom would ship across the Atlantic to what we call North America. First, as Spanish Conquistadors to the southern tier of America and down into Central and South America; later, would come the French and British. And thereafter, more “Africans” would come from other parts of that new “home”, Europe, to join previous settlers. Jason obviously has submerged himself into the myths weaved by these settlers about some magical qualities supposedly intrinsic to a change in skin coloration which evolved to cope with weakened UV exposure needed to synthesize Vitamin D production in the epidermal regions of our skin covering. Jason and his fellow “racists” are totally oblivious of the biochemical processes taking place in the skin in response to environmental forces—something a casual review of science books journals would have disabused him and others who would choose to become deceived into believing in the myth of “Racial Superiority” and the ancillary hoax called “Whiteness”. There is no force on earth, no human agency, philosophy, or political expedience which can ever disabuse Jason of his fallacious concepts he believes to be facts, and which by now are deeply ingrained. But there is an Agency not of this world, and which transcends human understanding, and which we know as a force commonly referred to as Religion. Knowing the science behind skin coloration and why humans developed differently as far as physical/cultural and technological aspects are helpful. But they don’t inspire the heart with that inner conviction of “The Oneness of Humankind”. This is an experience which extends beyond the ability of the brain to fathom—even though the mind can be informed to understand the basic outline. Which is why the “human heart” has been set aside for the “descent” into it of those lofty sentiments which originate from an unseen realm, and which sets sentient beings like ourselves apart as a unique form of creation. All of the Religions which have appeared in succession all explicitly of indirectly talk of this mystical source which is both within us and not within us from another perspective. The harmony of the spiritual explanation of what the human needs to aspire to, with that of the science explaining our outer nature, dispels on the one hand the estrangement as demonstrated by “White Nationalism”, and presents the reason for affinity to exist between humans and the imperative to allow it to take hold in the “heart”. This “descent” can only come about by “cleansing” the heart of false concepts, and superstitions which have arisen regarding “whiteness”.